The present case has been reported in the Indian Journal of Pathology and Microbiology. 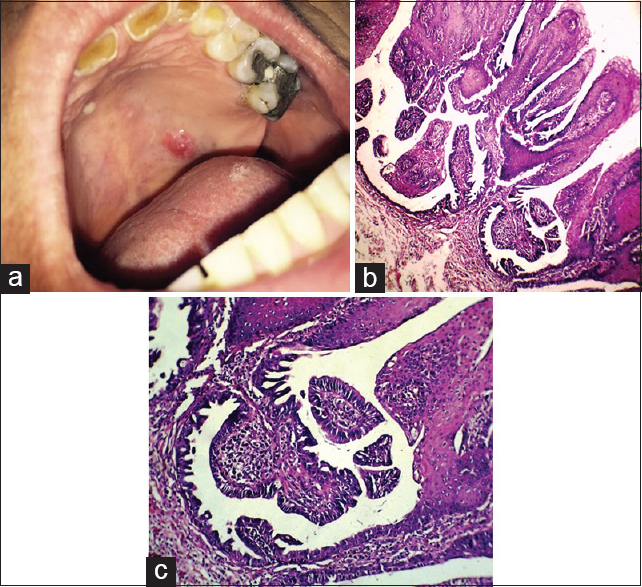 A 50-year-old woman was referred for the evaluation of a painless, reddish mass with slightly papillary surface in the left posterior side of the hard palate which had been presented for 1 year. She complained of roughness of the lesion surface. There was no history of previous trauma, and the patient had no other medical problems. Extraoral examination was normal. The mass was firm in consistency measuring 1 cm × 1 cm × 0.5 cm. There was no cervical lymphadenopathy, and routine laboratory investigations were unremarkable. According to clinical features, salivary gland tumors, hemangioma, and papillary lesions such as squamous papilloma and warty dyskeratoma were considered in differential diagnosis. Excisional biopsy was performed under local anesthesia. The microscopic features were consistent with the diagnosis of SP. Clinical follow-up was performed after conservative surgery, and the patient was free of tumor for 2 years postoperatively.